Sierra Stiegelmeyer in action Friday night. 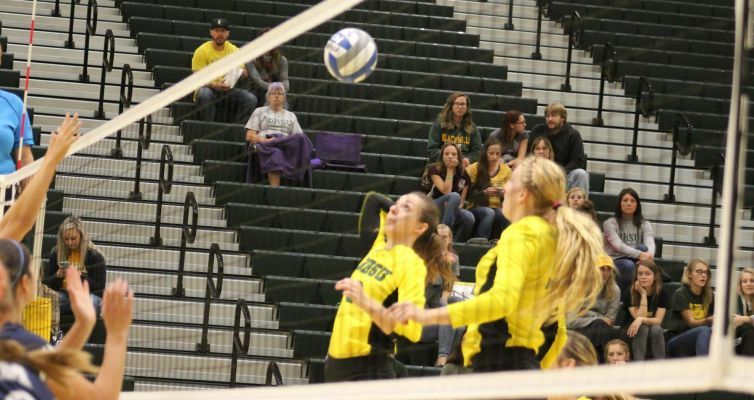 LAS VEGAS, N.M. – The Black Hills State University volleyball team came back to defeat New Mexico Highlands, 3-1, in its first conference victory of the season. The Yellow Jackets won by scores of 21-25, 25-20, 25-21, and 25-17. "Any RMAC win is big, but a road win after dropping the first set is huge," said head coach Kristin Carmichael. "I was really proud of how the girls kept their confidence and stayed consistent throughout the match. Our blocking really picked up late in the match which helped keep the momentum." In the first set, Highlands grasped a 5-0 run to kick off the match. The Yellow Jackets responded with a 6-0 run after kills from both Makayla Bell and Sierra Stugelmeyer to lead the Cowgirls, 6-5. Highlands took back the lead, and never looked back, leading the Green and Gold, 24-17. Back-to-back kills from Laurel Lech and Jadie DeLange led the Yellow Jackets to a 4-0 run, but the Cowgirls took set one, 25-21. The Yellow Jackets started to find a rhythm in the second set, going on a 4-0 run to lead the set, 4-0. Highlands began to cut the lead, but the Green and Gold took advantage of the Cowgirls errors to 16-8. A kill from Ellise Lech assisted by Laurel Lech punched the Yellow Jackets to a 25-20 set victory and tied the match, 1-1. In the third set, the Green and Gold kept the same stride to lead off with a 5-0 run, leading Highlands 5-0. The Cowgirls cut the Yellow Jackets lead to tie the set, 12-12, and took its first lead of the set with a 16-14 score. Two kills by Stugelmeyer got the Yellow Jackets going again for them to take the third set, 25-21. With back-and-forth action in the fourth set, neither team set a substantial lead. A kill from Madison Hoopman and a kill from Carisa Becerra put the Yellow Jackets ahead, 13-11. The Green and Gold went on a 4-0 run to take the set, 25-17, and the match, 3-1. Stugelmeyer led the way for the Jackets with 14 kills, seven digs, and four blocks. Alongside her was Laurel Lech with 34 assists, and Valerie Blake with 21 digs. The South Dakota School of Mines women's volleyball team fell short to CSU-Pueblo, 3-0, Friday night during a Rocky Mountain Athletic Conference match on the road in Pueblo, Colorado. The Thunderwolves defeated the Lady Hardrockers, 25-17, 25-9, 25-22. The 'Rockers posted 29 kills on 125 attacks, tallied 28 assists and came up with 58 digs. CSUP notched 43 kills on 155 attacks, earned 40 assists, 69 digs and 11 total blocks. The 'Rockers were paced by freshman outside hitter Dana Thomas with 10 kills on 33 attacks while senior Anna Breidt contributed with six kills on 25 attacks and sophomore Hannah Stevenson tacked on four kills on 13 attacks. Hardrocker freshman Shyann Bastian earned 21 of the team's 28 assists and 14 digs. Junior Allie Boggs also registered 14 digs.